The congressman takes steps to gauge voter support before deciding whether to take on Gov. LePage and Cutler in 2014. 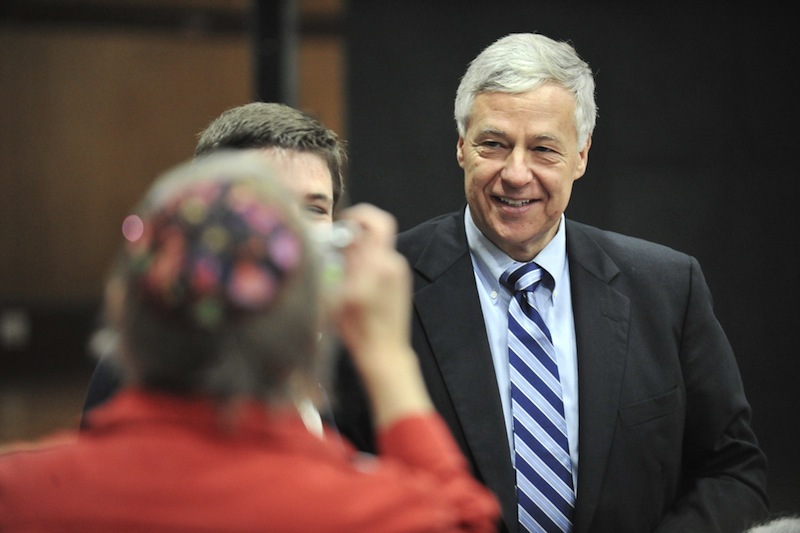 WASHINGTON — U.S. Rep. Mike Michaud moved closer Thursday to running for governor of Maine, launching an exploratory committee and a campaign-style website to test voter support before committing to run on the Democratic ticket in 2014. Michaud’s announcement was another sign that Maine will have a contentious three-way race – and possibly larger – as Republican Gov. Paul LePage seeks re-election. But the six-term congressman said he needs a few more months to gauge his support among voters and all-important campaign donors. Michaud said he plans to register as a candidate with Maine’s ethics commission within 10 days. In the meantime, he launched www.michaud2014.com, featuring a video and a prominent “Donate” button. Michaud acknowledged that his ability to raise money is a key factor in his decision because he plans to run a privately financed campaign rather than participate in Maine’s Clean Election program. “Money is definitely going to be important because it is expensive to run a campaign,” he said. Democrats are anxiously awaiting Michaud’s decision as they seek a nominee who’s capable of unseating LePage, whose conservatism and politically incorrect style have made him deeply unpopular among liberals and many moderates. Any candidate will also have to contend with independent Eliot Cutler, who narrowly lost to LePage in 2010 and plans to run again. Three other people — Democrat Steve Woods, Green Independent David Slagger and independent Lee Schultheis — have registered as candidates for 2014. In the eyes of several key figures, Michaud’s announcement appeared to solidify his intentions. Former Democratic Gov. John Baldacci, for example, has said he will run again if Michaud does not. But on Thursday, Baldacci suggested that scenario is unlikely. Cutler issued a statement welcoming Michaud into the race. “Maine needs a governor who will put the people of Maine first, not the political parties and the special interests on the left and the right that finance and control them,” Cutler said. Michaud, a former paper mill worker from the Millinocket area, served for more than 20 years in the Maine Legislature and held leadership positions such as Senate president before running for the U.S. House in 2002. He succeeded Baldacci as Maine’s 2nd District congressman. Without a high profile in Washington, Michaud has emerged as an influential voice on veterans’ issues. As the top-ranking Democrat on the House Veterans’ Affairs Committee, he has considerable input as the committee tackles issues such as a lengthy backlog of disability claims. Michaud would be in line to become the committee’s chairman if Democrats were to win control of the House. With his blue-collar background and popularity in Maine’s more conservative northern congressional district, Michaud is viewed by many as the Democrats’ best hope of defeating LePage and Cutler. Democratic Rep. Chellie Pingree, who represents Maine’s 1st Congressional District, considered running for governor but decided this spring not to enter the race. “It’s just step one,” Maisel said of the exploratory committee. Mark Brewer, a political scientist at the University of Maine, said he’s still not convinced that Michaud will run. “The pressure on him to do something has been enormous, but forming a committee and holding a press conference to say ‘I’m running’ are two different things,” Brewer said. Michaud’s “trouncing” of Republican Kevin Raye — the popular former president of the Maine Senate — in last year’s election shows that the 2nd District seat is likely his “as long as he wants it,” Brewer said. Even without committing to the race, Michaud wasn’t shy about taking a swipe at LePage. LePage won in 2010 largely by locking in votes from mainstream Republicans, conservatives and tea party members while Democrats and moderates split between Cutler and Democrat Libby Mitchell. The limited polling done so far on Maine’s next gubernatorial race shows that LePage could win another close race, against Michaud and Cutler. In a prompt response to Michaud’s announcement, LePage’s senior political adviser, Brent Littlefield, said “now is not the time to turn back to the failures of the past” as the governor works to create jobs, repay debts to Maine hospitals and strengthen the economy. “In his three decades as a politician, Michael Michaud has supported tax increases, job-killing regulations and helped grow the deficit and debt in Washington to the point where it now reaches nearly 17 trillion dollars,” Littlefield said in a prepared statement. Woods, the only declared Democratic candidate, criticized Michaud’s non-committal announcement, saying the last thing Maine needs is more committees.